One’s choir is singing in a grand concert on Sunday and one wishes for some sparkly neckwear. Our choir likes to put on the dog, we invite the State Governor (and she’s coming! ), we kit ourselves out in academic gowns and we sing in Latin. My academic gown and hood are red, a result of hanging around at Uni for so long they gave me a PhD to get rid of me. And look at me now, a blogging housewife. But if anyone ever wants to know the characteristics of the liquid crystal smectic C phase, I’m ready, I’m right there. I digress. Hmm, might use a proper camera for future jewellery photography. These pendants take me about two hours to make. It’s a bit hard to tell, what with pausing to hang out the washing, removing the cat from my jumper, cursing and leaping to my feet to get the washing in when it starts to rain. I need a stopwatch. The assortment on the left of the photo is an idea for the next one. I’ve made them in lots of different colours, but they make such good gifts that I don’t usually have many on hand. The last one I made I sold while wearing it, which is always a pleasing yet awkward experience. 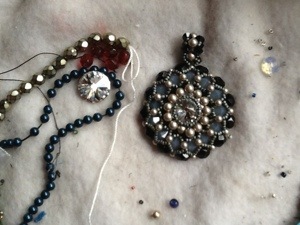 I think this one has a bit of a Jazz age feel, with the warm greys and the pearls. I’m going to take it for a test run at tonight’s dress rehearsal.